Merryweather & Sons is the world’s oldest fire-fighting equipment manufacturer, tracing its origin all the way back to 1692. 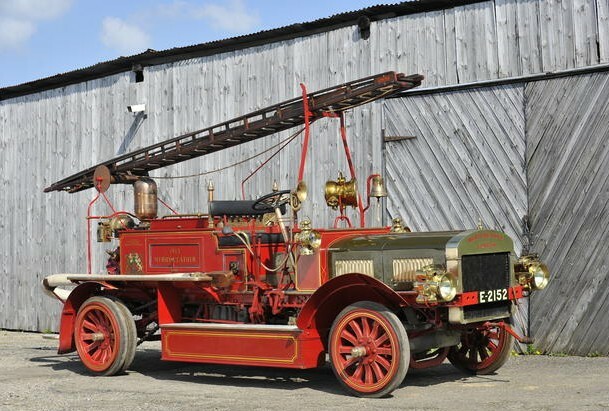 Their first self-propelled fire engine came in 1899 (it was steam-powered). The truck you see here is powered by an Aster engine – a monstrous 8.6-liter straight-four to be exact. It also has some serious pumping equipment on it and the restoration still holds up magnificently. Looking at it, you can see differences between old American and old British fire engines. It’s kind of a weird thing to notice. This should sell for between $76,000-$100,000. Click here for more info. This entry was posted in Uncategorized and tagged 1913, auctions, Bonhams, cars, classic cars, classic trucks, fire engine, fire truck, merryweather, trucks by classiccarweekly. Bookmark the permalink.